Green clown figuring, looks to be a sort of paperweight. 6 inches long from tip of hat to feet, 3.5 inches wide, about an inch thick. This little guy sports 2 metal bells on the tip of his cap, and his hat is rimmed in fur. The hat is glued on to the head and you can see a rim of the glue. He has a "porcelain" hand painted face, which may be plastic, and his body is filled with weighted bags of sand. He weighs 4.1 ounces. The outfit is made out of a lightweight material that is decorated with green blotchy stripes and blue blotchy blothes. He's in good condition, no rips and tears. 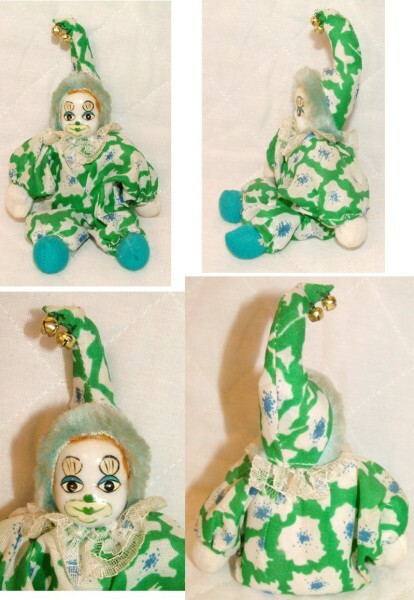 This little clown is over 30 years old, and has no tag. Small clown figurine, looks to be a sort of paper weight. 5 inches long, 3 inches across, about an inch thick. This little guy has fuzzy hair that looks like it may be made out of rabbit's fur. It sheds like rabbits fur, for sure! He has a "porcelain" hand painted face, which may be plastic, and his body is filled with weighted bags of sand. He weighs 2.9 ounces. The outfit is made of a lightweight material colored with a paste flower pattern colored in blues, green and pinks. He's in good condition, no rips or tears, but the hair appears to be dirty in the front. This may be washable, but cleanup is at your own risk. 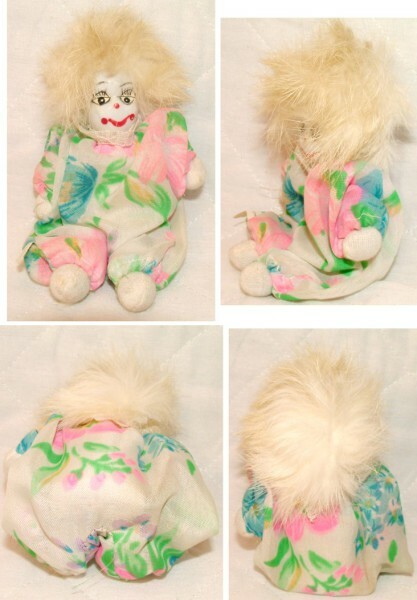 This little clown is over 30 years old, and has a tage that says "Made in China" near his right foot.